Gerard de Rooy and Wuf van Ginkel made their mark immediately in the first stage of the Africa Eco Race. In the special stage of 92 kilometers De Rooy put down the third time overall, 5:25 minutes behind the Russian Vladimir Vasilyev with his Mini, and Wuf Van Ginkel the sixth (+8:56). 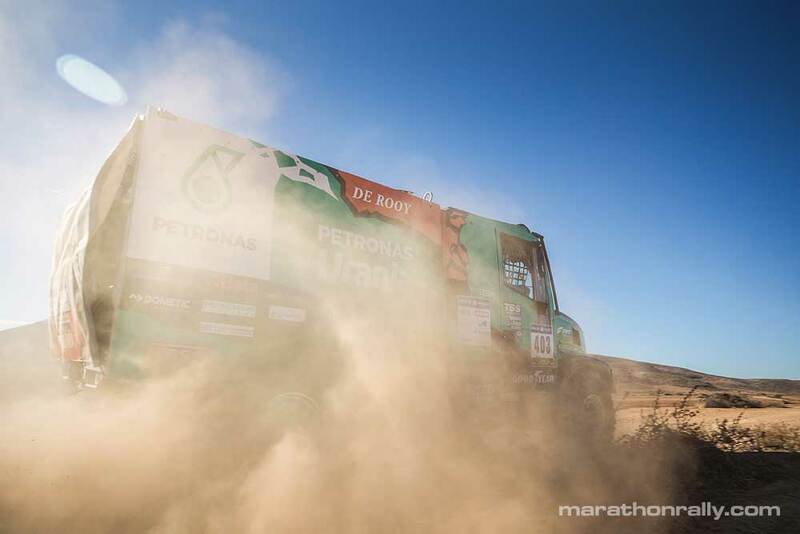 The stage from Nador to Dar Kaoura, in the north of Morocco, gave no problems for Petronas Team De Rooy Iveco, but was quite difficult because of dust and stones. "That made it quite tricky," said Gerard de Rooy. "With all those stones on the side of the track, I could not drift well. I did not want to run the risk of punctures. That did matter in terms of speed." It was even more difficult that the sentinel – the warning system making it possible to indicate that a faster participant arrives, but that also gives a signal when someone is standing still at the track – did not work with any of the trucks. Remnants were therefore not clearly visible, but in turn they didn’t see the faster trucks coming up behind them either. "Overtaking these small SSVs and slower cars took a lot of time," De Rooy said. "A few times I’ve been driving next to the track to pass, but that also involves risks. I think I’ve lost some five minutes with that." Wuf van Ginkel also lost time because of the non-working sentinel. As the fourth truck, he quickly closed the gap to Elisabete Jacinto, who didn’t notice the Iveco behind her because of the dust. "We also could not indicate that we were there. At one point we did take the risk in the dust to get close behind her and let them know by horning that we wanted to pass. As soon as that was possible she immediately went aside, but it took a lot of time. I think those SSVs and the slower cars have been shocked a few times that a truck suddenly appeared from the dust." De Rooy came at the finish of the special stage with a side window missing. "At 10, 15 kilometers before the finish there was a group of stone throwers. We got a vowel through the side window. Fortunately, nobody has been injured. Some others got stones on the windshield." Van Ginkel saw the group standing at the exit of a bend, just at a point where he drifted the truck. "As a result, I drove more or less straight to them and apparently they got scared because they hurried away. That has probably been our luck."